I am not new to Spicy Thai at Aljunied Avenue 2. In fact I have been back for a couple of times with my friends for the Thai food. What makes me come back again and again probably is the exciting menu. There always seems to have something new on the menu each time I am back. We started with some Prawn Cake ($2/pc). 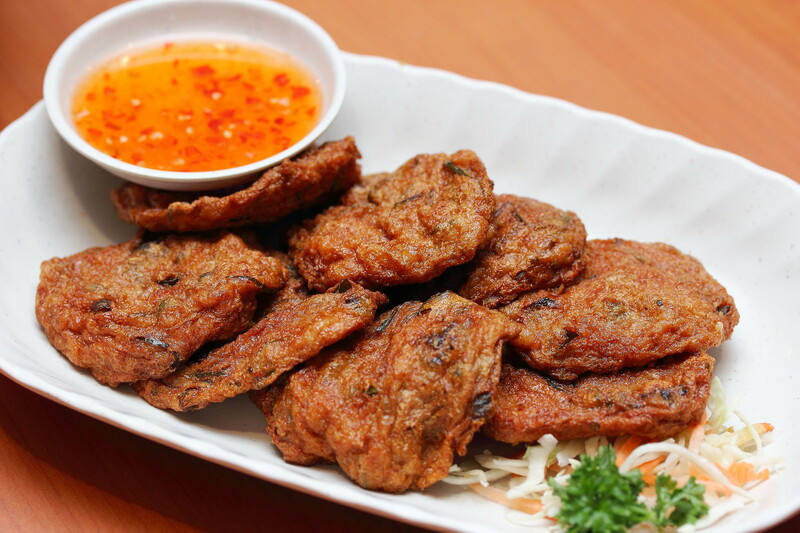 I don't usually order the prawn cake because many times I have restaurants servicing me one that is mixed with too much flour or too thick with its batter. I would say the prawn cake at Thai Spicy is one of the better ones that I have eaten. 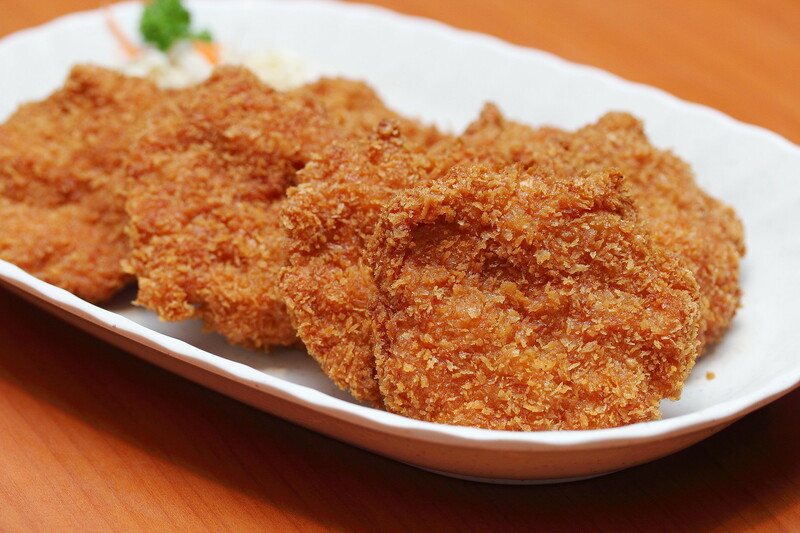 The Fish Cake ($2/pc) was springy and has a hint of spiciness. Paired it to sweet chilli sauce for a more delightful enjoyment. This is one salad that the carnivores will applauded. 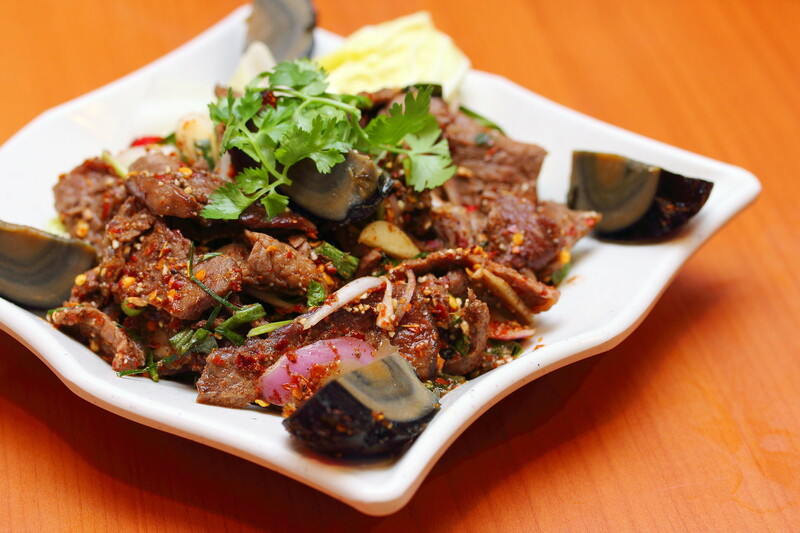 The Nam Tok Neua (Basil Beef) Salad ($15) comes with beef strips tossed in a spicy thai sauce served with century egg. There were not much vegetable except for the basil flavour that is infused to the beef. The meat was a bit tough to my liking but the sauce was top notch. Not forgetting my favourite century egg. I was told that Spicy Thai has recently engaged a grill expert from Thailand and I was eagerly looking forward to the grill items. 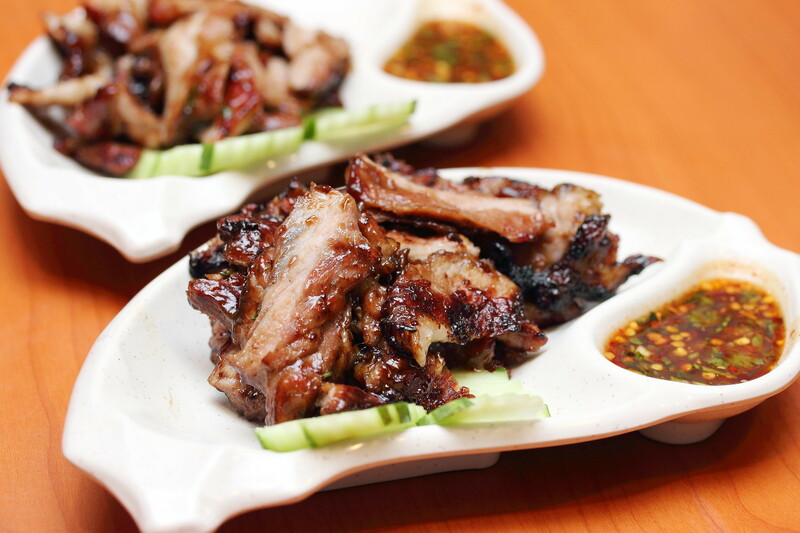 From the grill section of the menu, I tried the BBQ Pork Neck ($10) and BBQ Chicken Wing ($6 for 4pc/ $9 for 6pc). 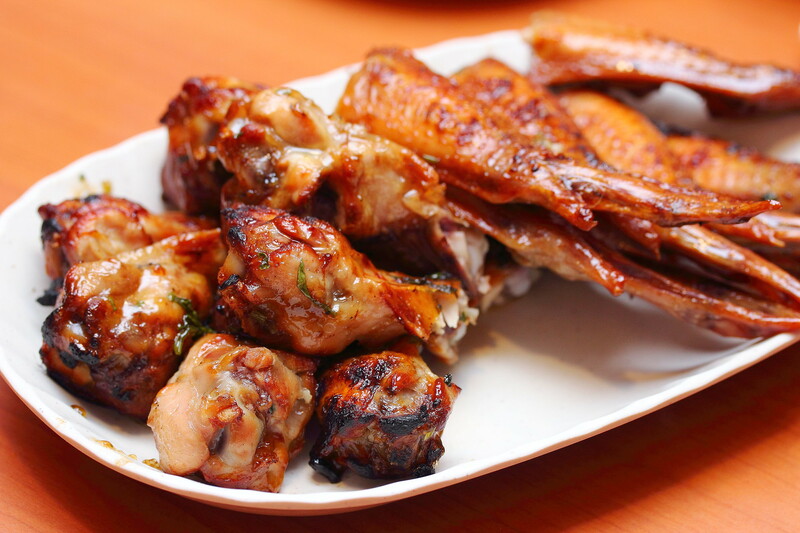 Both the pork neck and chicken wing were really well marinated and grilled to perfection. The infused sweetness with the smokiness and slightly charred surface made these finger licking good. I had the Deep Fried Kang Kong with Special Thai Sauce ($10) in my previous visit. It was a unique creation definitely. Compared to my previous visit, it seemed like there was a bit more batter giving it a more crispy crunch. Having it alone is it bland. It needs to pair with the special thai sauce. Quite similar like have Indian rojak. 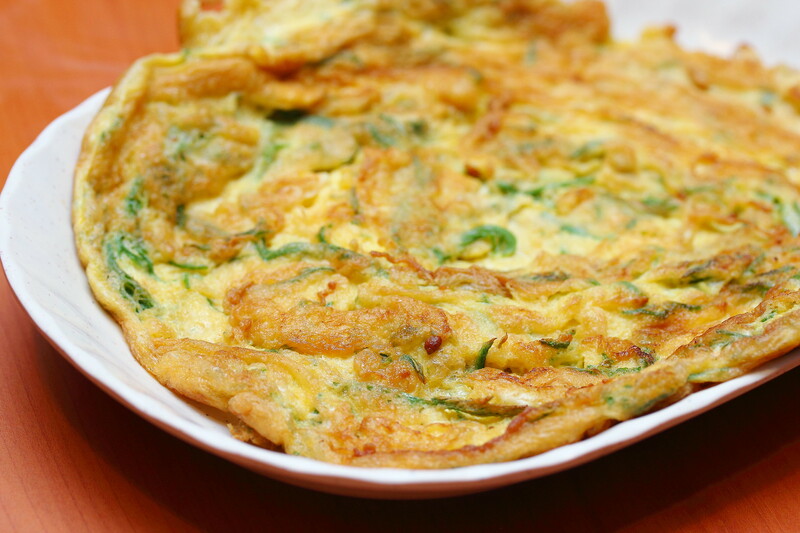 I am glad the price of the Dill Pattie (Cha Om) Omelette ($8) has not increased since my visit almost a year back. It was also great to note that they have used for dill pattie in the omelette for the herby taste to stand out more. Crispy Seafood Lad Na ($6) was another dish that I tried previously. 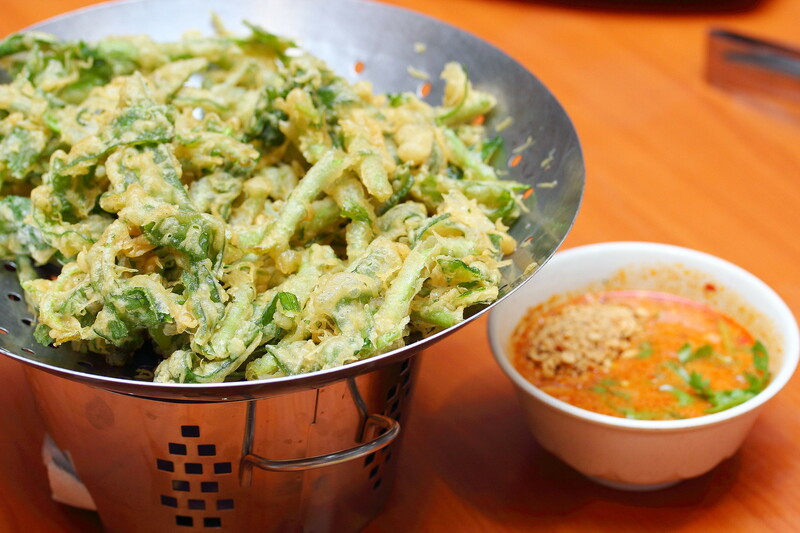 Now the fried hor fun is served separately from the gravy for retaining the crispiness. I actually think otherwise. 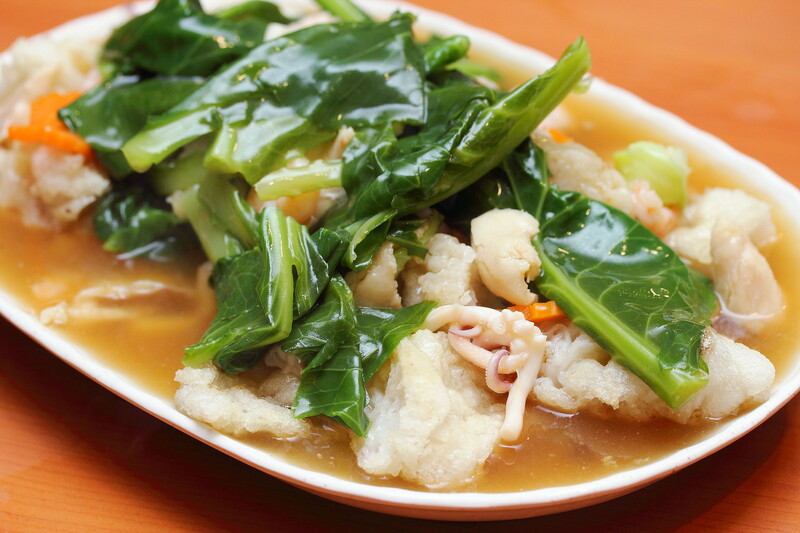 Although the crispiness is retained, the dish felt separated without stir frying the hor fun with the gravy to infuse the flavours. 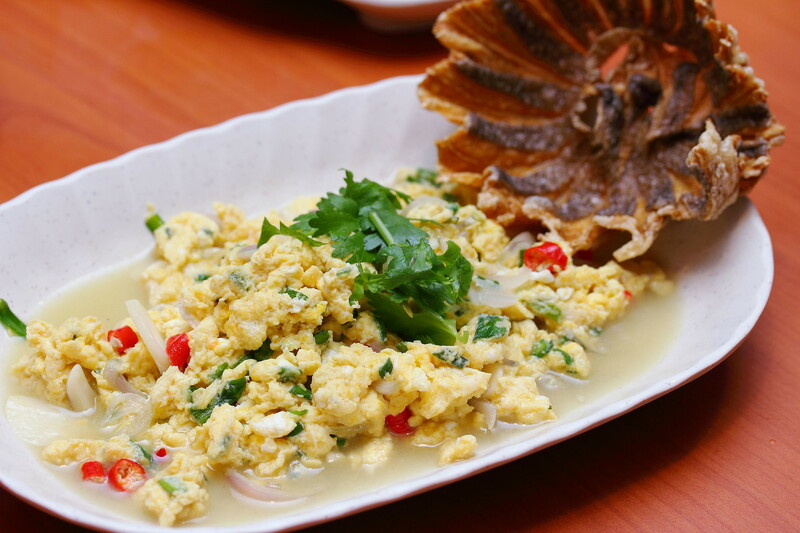 For a healthy option there is the Water Fry Egg with Thai Style Crispy Sun Dried Fish ($12). Very interesting way of fying egg, I would love to learn from the chef how to do it. 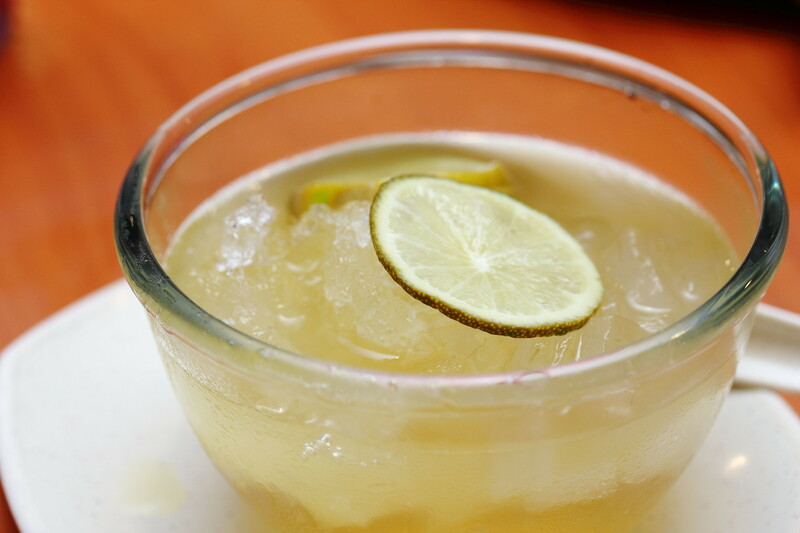 Just be warned that it is packed with a spicy, tangy kick. I thought the crispy sun dried fish was additional, it did not really complement the dish except for decorative purposes. Nevertheless it was really crispy similar to the ikan bilis. 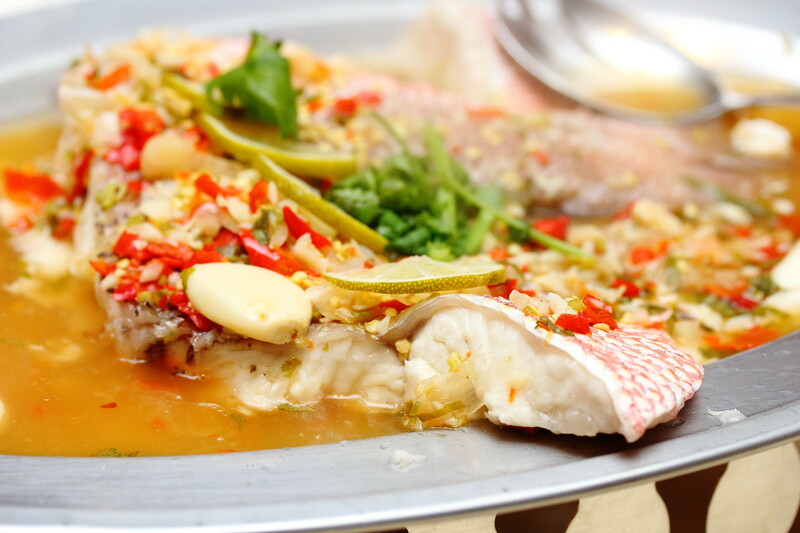 Moving on to the new items on the menu, we started with the Red Emperor Snapper with Chilli Garlic (market price). Simplicity at its best with the garlic and chilli combo plus a bit of lemon zest to boost up the whole natural flavour of the fish. Everyone on the table enjoyed it. However, I thought the fish was a bit overcooked by a minute or two but overall it was a very good dish. Another fish dish on the new menu is the Thai Walking Cat Fish with Spicy Lemon Soup ($28). Restaurant seldom serves cat fish on the menu but it is actually quite tasty. The flesh is firmer compared to the red snapper. 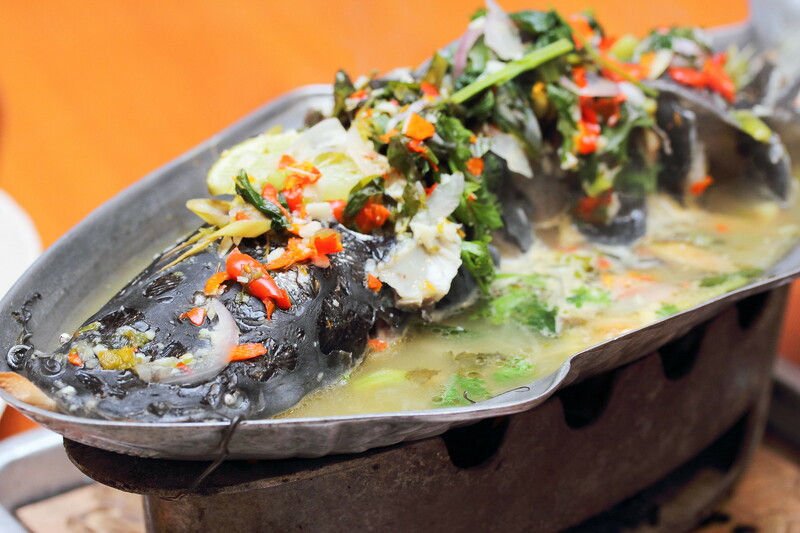 I was concern of the earthy taste of the cat fish but it was well covered by the spicy lemon soup that is used to cook the fish under constant charcoal heat. 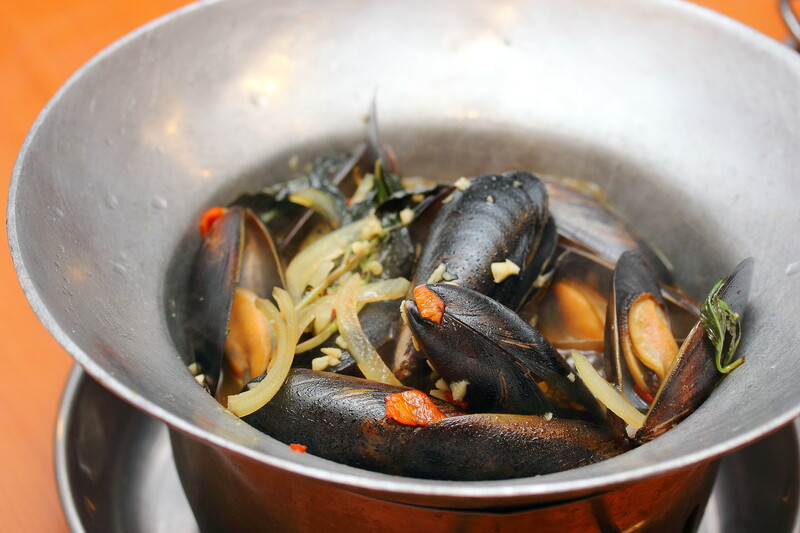 Still on seafood, we tried the Basil Mussels ($15). 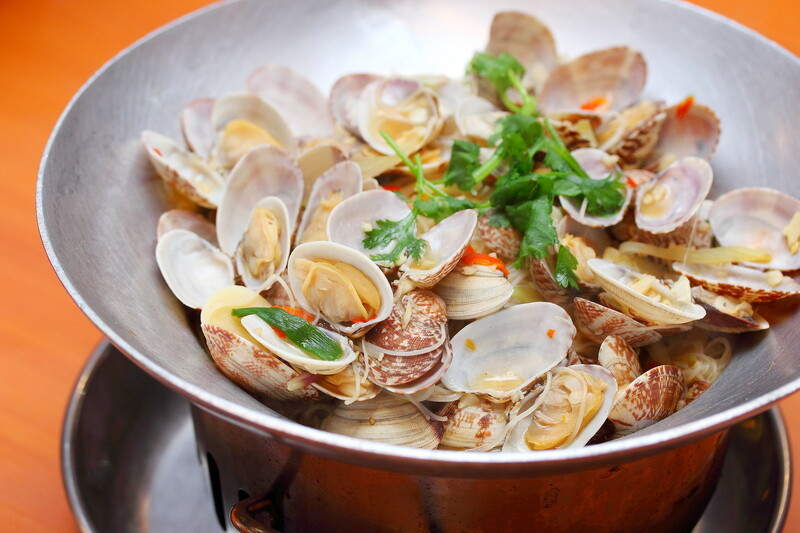 I enjoyed how the basil flavour has been infused into the shellfish giving it an addition aroma. The highlight for the dinner probably was the Lala Beehoon ($18) and one of the newest creation I was looking forward to try. 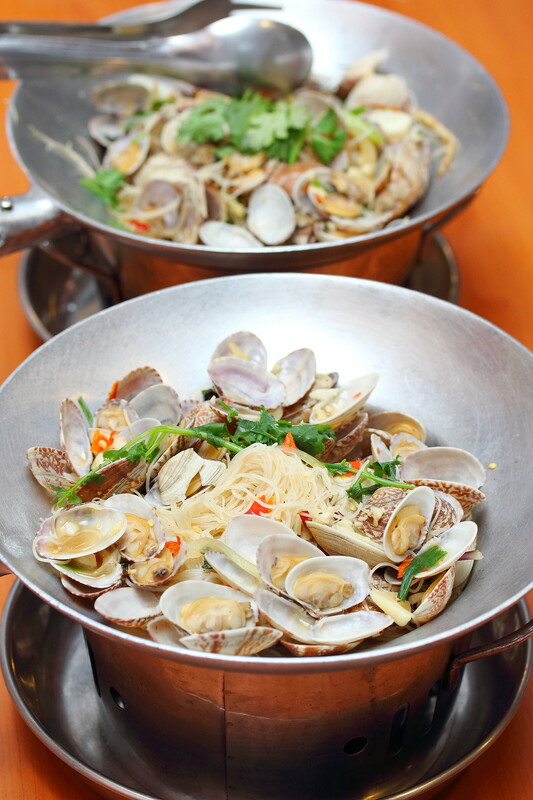 The silky smooth beehoon was buried underneath a pile of sweet clams. Most of us enjoyed it but some felt that it was too peppery for their weak tongue. The peppery kick did give me an adrenaline rush but I thought it overshadowed the sweetness of the clam that supposed to be absorbed by the beehoon. Not forgetting the desserts to wrap up the sumptuous dinner. 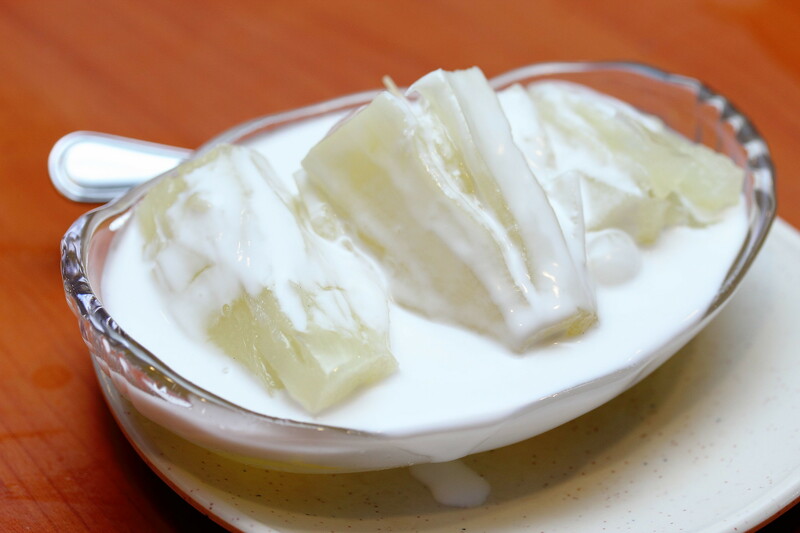 Spicy Thai offers a good selection of Thai desserts such as the Lemongrass Jelly with Aloe Vera Cubes and Calamansi ($2.50), Tapioca in Coconut Milk ($3.50), Thai Red Ruby ($3.50) and Sticky Glutinous Rice with Mango ($6). The lemongrass jelly and red ruby are perfect to cool off that fiery tongue after all the spicy food. 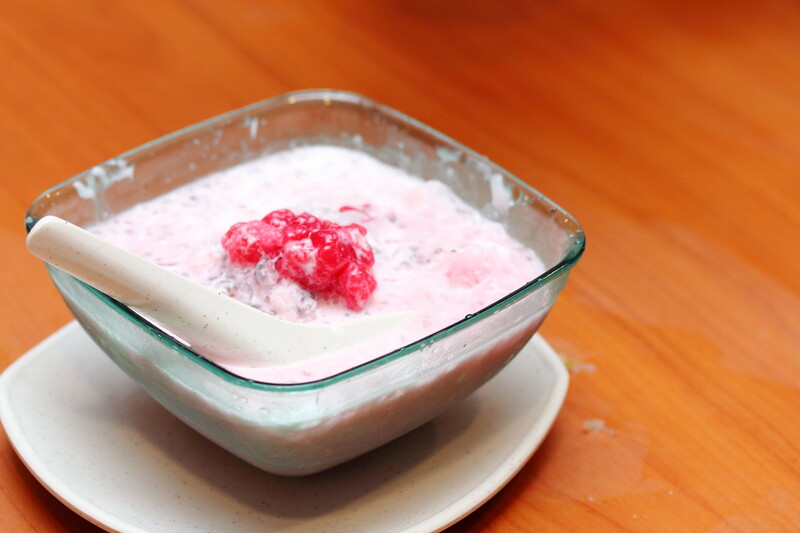 The tapioca was steamed to a delectable softness that is excellently complemented by the sweetness from the coconut milk. 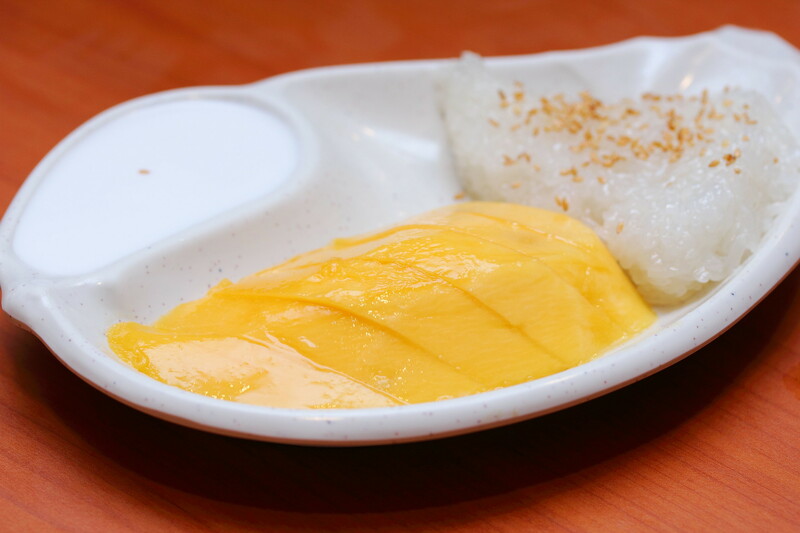 Last but not least the classic mango sticky rice to complete the delicious meal and wonderful company.